Just off Junction 11 off the M60 motorway and opposite the fabulous Trafford centre. At this fabulous New Wedding Venue, The AJ. Bell Stadium is also the new home of the Salford Reds Rugby League Club. Bridal Catwalk shows at 12pm and 2pm exhibitors include,Bridal Wear, Menswear, Cakes, Stationary, Make up, Flowers, Chocolate Fountains, Candy Carts, Vintage Props, DJ’s live Bands, String Quartets, Harpist, plus much more and of course Award Winning Wedding Cars from Horgans Wedding Cars. This Event is under new Management/Organisers Chic Elite. 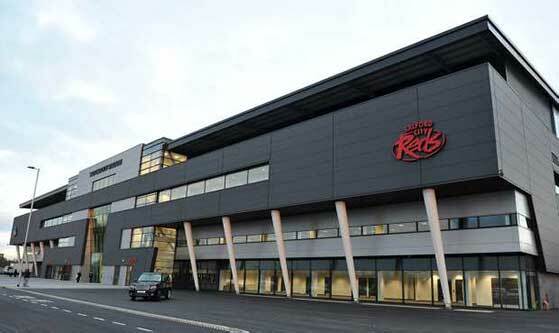 The City of Salford Community Stadium is the home of Salford Reds and SALE SHARKS Rugby League Clubs. Salford City Council formed a joint venture company with Peel Holdings to develop and deliver the £16 million stadium, which will form part of the overall £26m development of the area currently being developed in Barton-upon-Irwell.